My wife was operated on to alleviate bleeding in her brain after a stroke. She now cannot stand up due to dizziness. Where should she go to get diagnosed and what kind of therapy should she undergo? You are here: Home / FAQs / My wife was operated on to alleviate bleeding in her brain after a stroke. She now cannot stand up due to dizziness. Where should she go to get diagnosed and what kind of therapy should she undergo? It sounds as though the stroke was the hemorrhagic type, which is why she needed surgery. Strokes affecting the back of the head can have vertigo as their main symptom and this is likely what happened to your wife. This vertigo is very unlikely related to an inner ear problem. 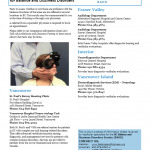 At this point, having a vestibular or inner ear assessment is not recommended. The focus should be on her recovery from surgery. As she recovers and feels able to start moving, sitting up and so on, there should be a physiotherapy team at the hospital that can help her in regaining function. Then, after discharge, a more formal rehabilitation process can begin with physiotherapy.